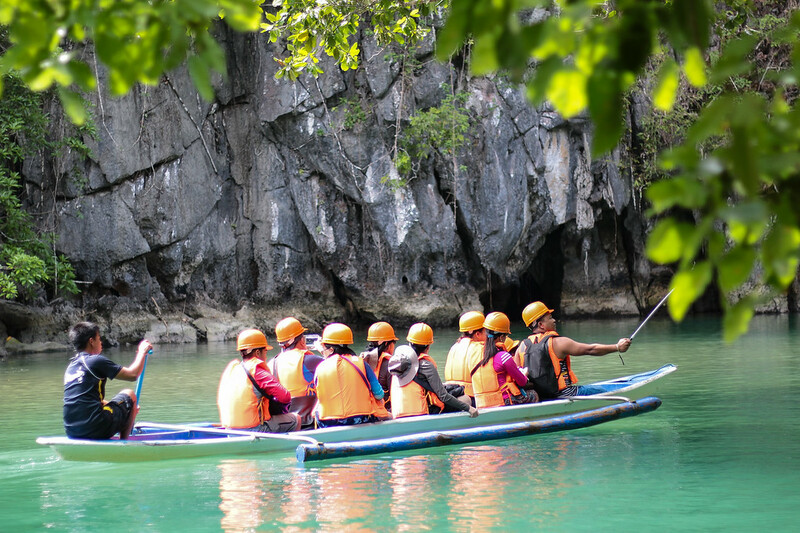 The Puerto Princesa Underground River is located in the Subterranean River National Park, a natural reserved located in the beach town of Sabang, approximately 80 kilometres north of Puerto Princesa, on Palawan Island. 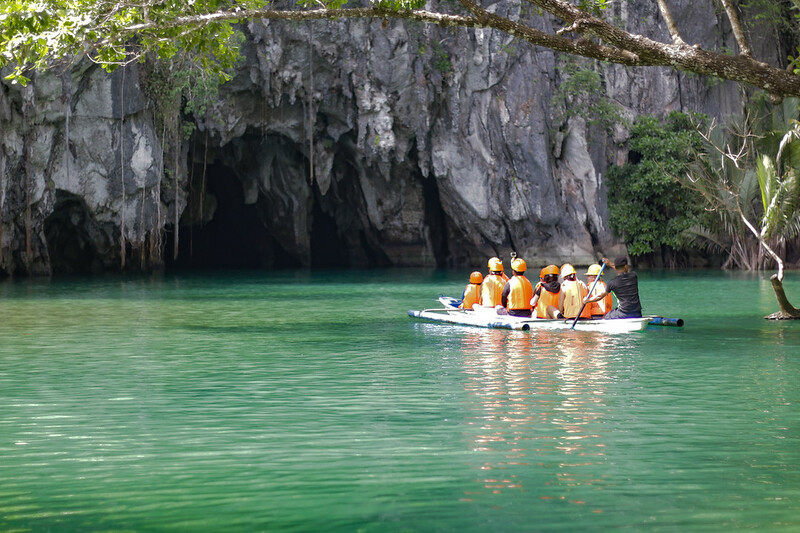 Today, the Underground River is the 6th Natural Wonder of the World and a World Heritage Site. It has been recognised for having its own ecosystem and one of the most complex cave systems. Therefore, it is one of the most visited landmark in the Philippines. Which means it is VERY touristy. You’ve been warned. To get there, you can book one of the daily tours leaving from Puerto Princesa. After some research, the most recommended and cheapest tour I found is organised by 3bs Tours and Travel (1,560 PHP/pax). The tours include transportation from/to your hotel to Sabang, lunch, permits, environmental fees, boat & guide. If you’re like us and don’t particularly enjoy group tours, then you can organise your own tour of the Puerto Princesa Underground River. Here is a step by step guide on how to organise a tour of the Puerto Princesa Underground River by yourself. Go to the Puerto Princesa Underground River Booking office in a building called “the City Coliseum” in Puerto Princesa City Proper (Did you know they say “city proper” and not “city center” ? Am I the only one to be surprised ?). You cannot book the permits online or in advance, you will have to go to the office in person. We did it one day before right before Holy Week started and we got our permits so a day before should be fine, but if you can, be there in advance. They have a limited amount of persons allowed in the river and therefore a limited amount of permits to be sold to walk-ins, the rest is for the tour companies. When you get in, you’re supposed to get transaction number and wait for your turn. But we just announced ourselves and talk to one of the office members behind the counter directly. You will have to fill a form, give your personal details and proceed to two different payment counters : one for the permits and one for the mandatory audioguides. In Puerto Princesa, go to the San José Bus Terminal, in the northern part of Puerto Princesa city. You can either ride a tricycle or “trike” for 50 pesos if you know how to bargain, or you can ride a jeepney with a sign saying “New Market/ San José”. It’s 10 pesos per person, no more, no less. There go to Lexxus terminal, Lexxus is the bus company to go to Sabang. Just ask around the locals they will give you directions. They have buses leaving almost every 2 hours, last one is at 5ish. Keep in mind that in the Philippines, the shuttle vans never ever leave on time. 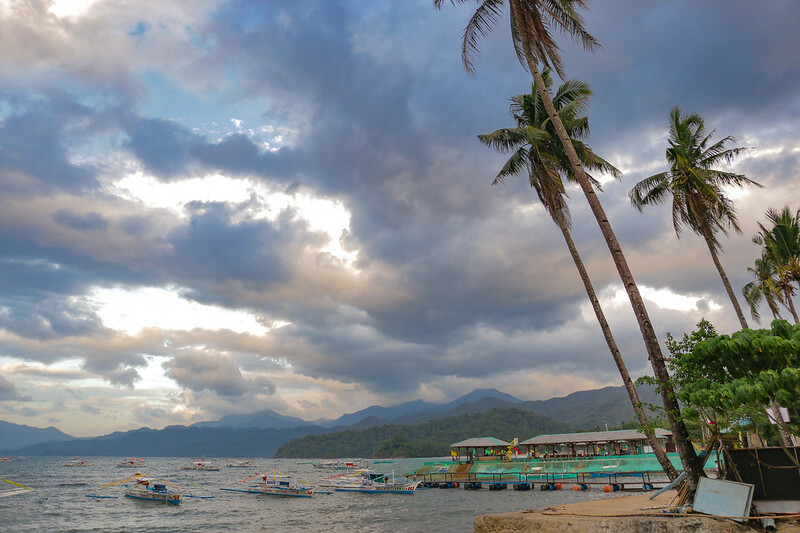 Try to arrive in Sabang before 5pm though, to enjoy one of the Philippines’ greatest sunsets. You can book in advance, but you might not get your seat reserved as you thought it would be. So you can as well show up half an hour before the departure and you’ll probably get lucky. It should be 200 pesos/person, no more. We recommend you to go to Sabang the day before you want to do the tour, and spend the night there. That way, you are in the river in the morning, before all the crowds come in. All the daily tours leaving from Puerto Princesa leave in the morning but by the time they drove to Sabang and stopped for lunch, they actually do the tour in the afternoon. The bus ride takes between 1.5 and 2 hours and it’s a bumpy one ! Maybe bring a plastic bag ? 😉 When you arrive in Sabang, don’t forget to book your bus back to Puerto Princesa or Port Barton as they can get filled up pretty quickly. You definitely do not need to book in advance a place to stay in Sabang. There are so many options from budget to luxury. 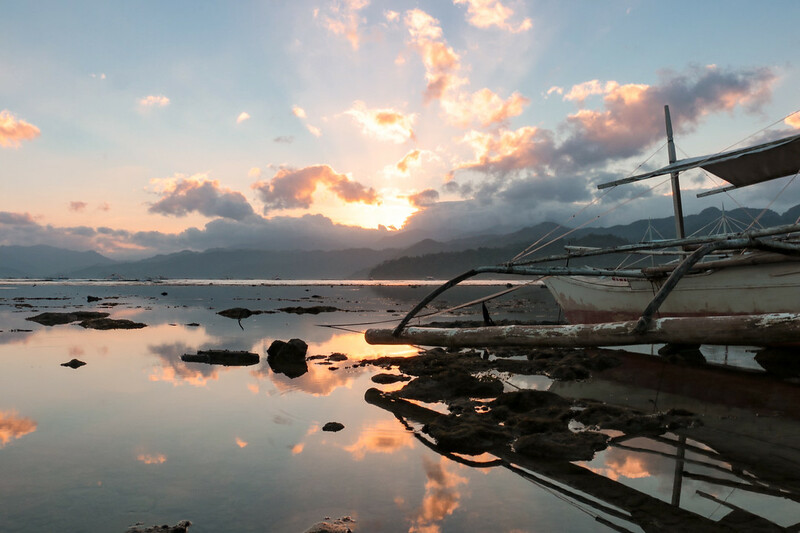 Keep in mind that because most of the tourists visit the Underground River with a tour company from Puerto Princesa, they don’t spend the night in Sabang. Which means a lot of hotels and guesthouses seem to be old and not taken care of. If you’re not fussy, it will be fine. We stayed at Dab Dab Cottages, on the western point of Sabang. They have terrible reviews but I’m not sure why. Sure the rooms seemed a bit dusty. Sure there are some mosquitoes and ants. But the bungalows are made of bamboos and wood, you are in the middle of nature and next to the sea. Don’t expect more from that. And to be honest it was fine, no bed bugs, the room was clean, breakfast was good. No complains. We paid 700 pesos / night for a bungalow for 2, excluding breakfast. I still think we should have negociated it for 600 but we didn’t want to waste time and miss the sunset so we just went for it. 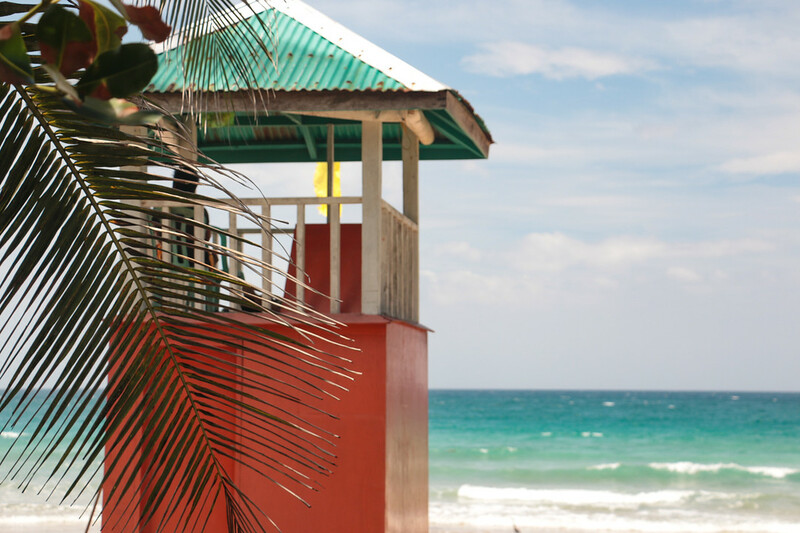 Walk your way alongside the beach front, passing through the luxurious Sheridan Beach resort and you will find many little restaurants. Most dishes are around 200 pesos. You have your permits but now you need to go to the office on Sabang pier to register. They open at 8am and you want to be there before, to be in the first persons to get on a boat. You will see there are already a lot of people doing the same thing. You first announce yourself and give them your permits, then you sit down, wait, and they will call your name. After a few minutes of waiting, you will have to pay the environmental fee to them (150 pesos per person) and they will stamp your permits as a proof. Now go back outside and show your permits to the guys organising the boats. The underground river is accessible by foot by a 3 kms hike (which you have to pay 200 pesos per person now !) or by a 20 minutes boat ride. Wait for them to put you on a boat with other people to share the costs. Because you are not part of a group you will have to wait for more people to fill the boat (up to 6 people) or ask around yourself. 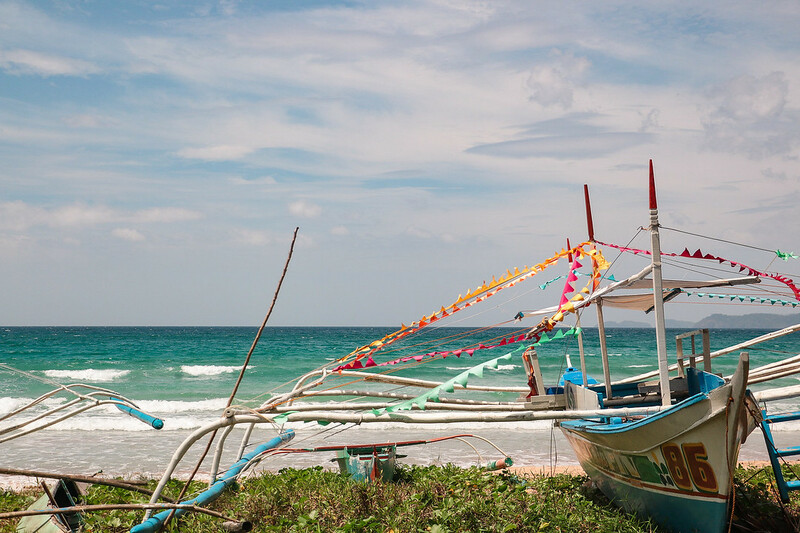 Then, when a boat is ready for you, you will have to pay 185 pesos each. That is if there are 6 persons in total on the boat. We got there at 8am and left on the boat at 9.30am so you see why you need to be there early ? Step 5 : Visit the 6th World Natural Wonder ! You are not allowed to visit the underground river on your own paddle boat, so you will be put on one of their own paddle boats with the same people that came with you on the boat from Sabang. Your boatman will come with you to the beach to get your helmet (be prepared to look like Bob the Workman), your audioguides and put you on a boat to visit the river. Again, there will be a lot of people, some in groups already, so you will just have to wait for your turn, until they can give you a boat. After around half an hour of wait, we got ours and our tour started. The tour lasts about 1 hour. The guide paddles the boat and uses his torchlight to show you the different mineral formations and sights not to be missed. Listening to the audioguide will give you lots of informations but try to take your earphones off from time to time to enjoy the peaceful silence inside the cave. At the end of your tour you go back to the boat to get you back to the Sabang pier, still with the same group of people you took the boat and did the tour with. That’s it ! Now you’re free to enjoy Sabang’s other tourist attractions. You can take a bus back to Puerto Princesa the same day or continue your journey to Port Barton. Lexxus have a booking office right by the pier to book a bus with them. Mangrove paddle boat tour (200 pesos per person) : we did it and it was lovely. Although when you do it in the afternoon you don’t see much wildlife as the animals are usually sleeping. Overall if you count the return bus to Puerto Princesa and the lunch you are only saving a few pesos compared to the organised tours. But the main catch is to be able to visit the river in the morning, when there are less people. You can also go to Sabang the day before and organise a tour with your accommodation there without doing the whole booking permits in Puerto Princesa thing. A Spanish couple we met there, spent the night at Daluyon Tourist Inn and they organised a tour with them for something like 1,000 pesos each if I remember correctly. Although we did Couchsurfing the first 2 nights at a lovely couple’s home, when we got back to Puerto Princesa at the end of our trip around Palawan after 2 weeks, we stayed at a place called Butterfly Totem Guesthouse. If you are looking for a quiet budget room near the airport, then it’s the deal. It’s 1,100PHP/room/night for a double room with 2 breakfasts, the lady is lovely and she has 2 talking birds. Which is a detail but still something I had to mention.